If you deposit items to PRISM: University of Calgary’s Digital Repository, the system will track usage statistics for you. Each table or graph in your statistics dashboard reports aspects of your usage statistics. 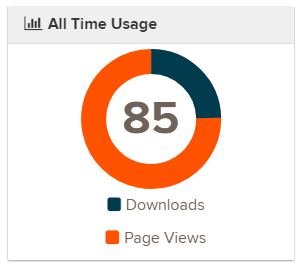 The All Time Usage graph will display the total number of item record views (page views) and file downloads of your item since your item was accepted into PRISM. 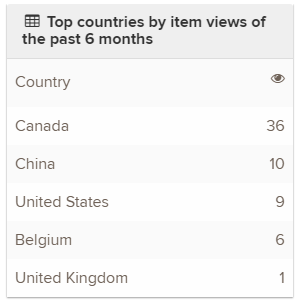 The Top countries by item views of the past 6 months table tracks the locations of computers that have accessed your item record over the last six months. 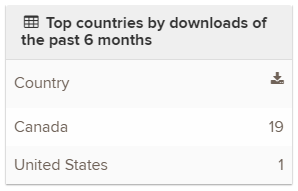 The Top countries by downloads of the past 6 months table tracks the locations of computers that have downloaded files in your item over the last six months. This number can vary significantly from the item record views. Note that in major search engines, like Google Scholar, users can bypass your item record completely and go directly to accessing the files in your item. The Item views by month graph tracks item record views over the last six months. The Downloads by month graph tracks individual file downloads over the last six months. The Popular works based on item views table will give you a table listing of all records in PRISM with the same author and the number of item views so that you can see which one of your items is the most popular. The Popular works based on downloads table will give you a table listing of all records in PRISM with the same author and the number of file downloads so that you can see which one of your files is the most popular.